I went to Nanjing in January for the JiangsuTV station. Today the show was broadcasted. Here is the link to the video of the TV show. I appear starting at 16 min being interviewed by the two TV show hosts Li Ai and Peng Yu. Well yes, the interview is all in Chinese. 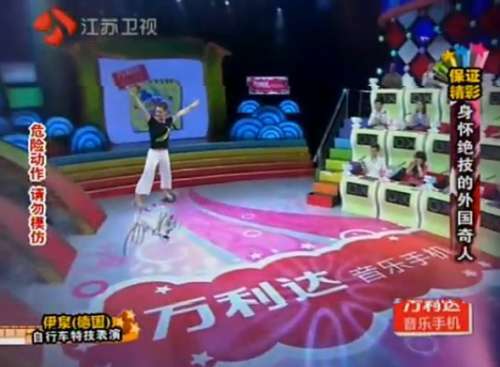 But I do bicycle tricks starting at 29 min and that needs no knowledge of Chinese to understand it. You are currently browsing the China, Asia, Climbing and Fixed Gear Bikes blog archives for Februar, 2011.